Just got back from a weeklong jaunt in Europe. When I lived on the East Coast of the US, we'd go to Europe quite frequently, often multiple times a year. Now that we live in California, I feel compelled to maximize every trip there. 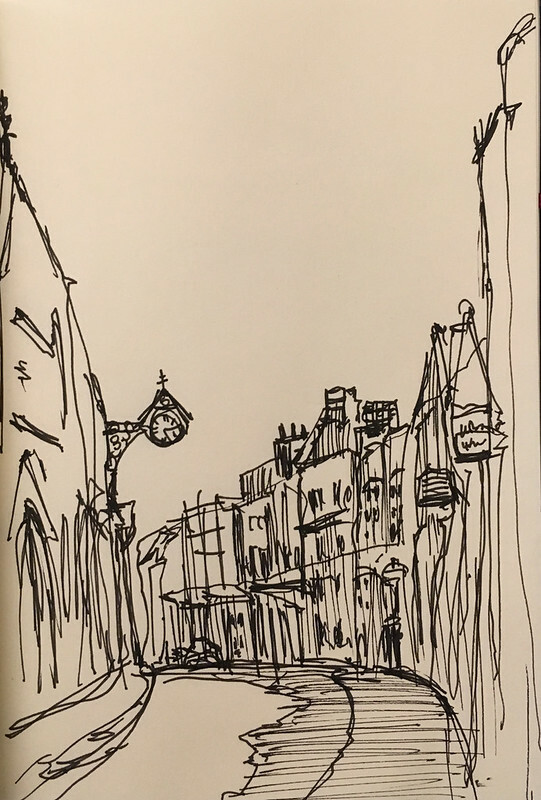 So when we booked our travel for the 9th Urban Sketchers Symposium in Porto, it made sense to stop in the UK first, to see friends and visit places familiar and new. 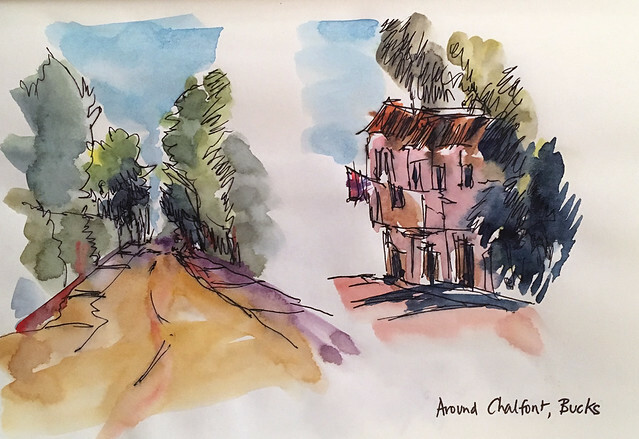 We stayed with friends northwest of London the first night, and to warm up I sketched a few vignettes from the car as we were driving around the next day. That night we were in for a treat. 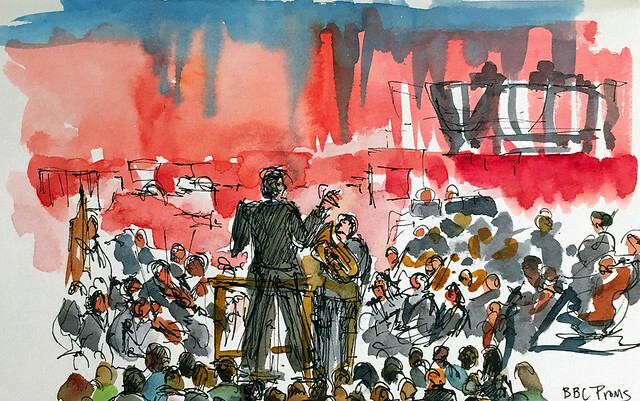 It's been a dream of mine to go to the BBC Proms, the legendary classical music concert series that takes place each summer in London. We were fortunate enough to have a friend apply for and snag tickets to Prom #3, featuring winners of the BBC Young Musician competition (including Sheku Kanneh-Mason, the cellist who played at Prince Harry & Meghan Markle's wedding!). We made it to Royal Albert Hall just in time for the start of the concert. The venue was bathed in lights for dramatic effect. The space right in front of the stage was reserved for prommers, those who queue for hours to get inexpensive standing-room tickets. 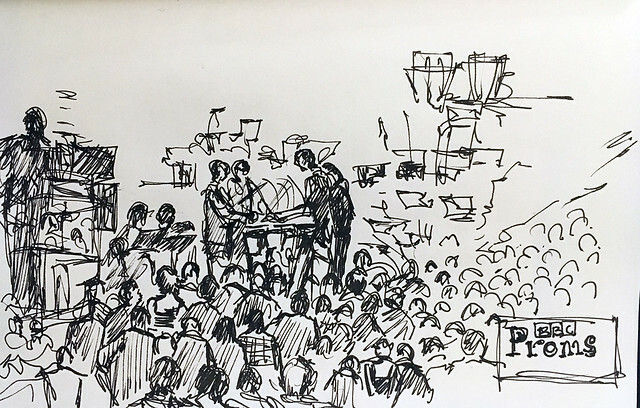 I especially liked sketching the percussionists. They were intense! The following day, I went museum hopping. First I stopped at the National Gallery to see the beautifully curated Monet & Architecture exhibition. It was amazing to see how Monet rendered the built environment in Antibes, Rouen, Venice, London, etc., with his trademark strokes of broken color. See information about the exhibit, and read Google Arts & Culture's interview with a curator. I also went to the National Portrait Gallery next door, to see the BP Portrait Award 2018 show. Wow, wow, wow. I'd seen the winning painting previously in a magazine, but to see it and the other finalists up close was a revelation. Of course, no trip to London would be complete without visits to art supply stores. I was able to hit three: Cass Art, at Charing Cross; the warehouse-like Atlantis Art Materials, which recently moved to London Fields; and Great Art in Shoreditch. Great Art was new to me, and I was impressed by the selection. 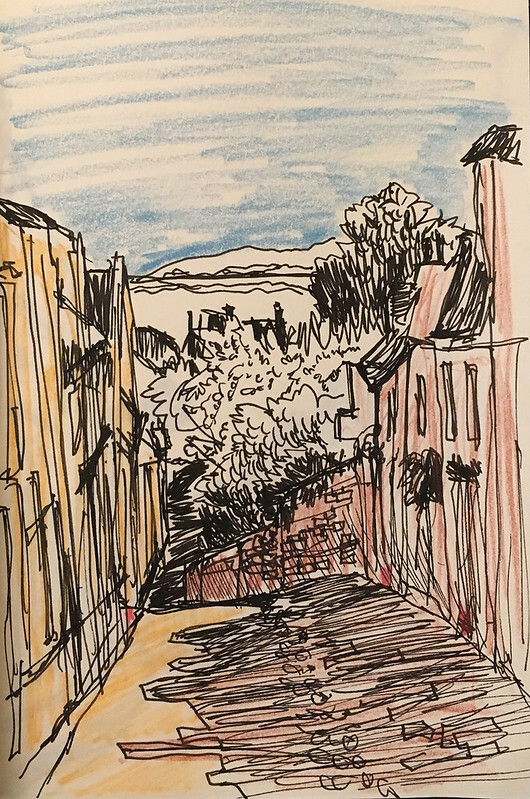 On Tuesday, we took the train south to Lewes, a Sussex market town that was our base for a hike along the coastal path. Its high street has a diverse selection of boutiques and retailers, including my new crush, Seasalt Cornwall. In one of the charity shops along the road, I picked up a copy of Nubia: Sketches, Notes & Photographs by Margot Veillon, a reportage-like account of the author's experiences in a culture that was later displaced due to the building of the Aswan High Dam in Egypt. Our base in this area was the lovely Blue Door Barns B&B, just outside of town. 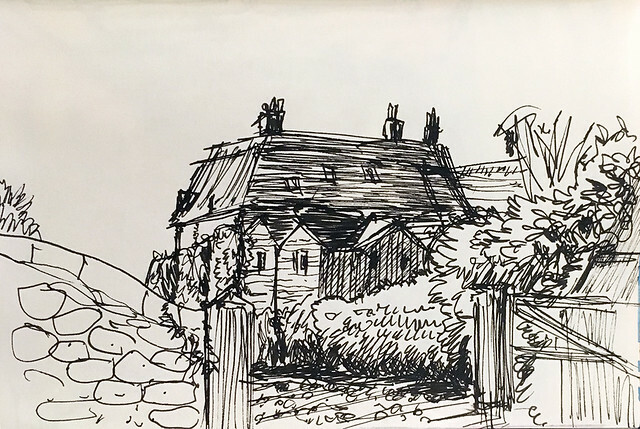 As we waited for the taxi to take us to Seaford, I rapidly sketched the view from the patio. We walked along the beach and the coastal path east from Seaford until the white chalk forms of the Seven Sisters came into view. 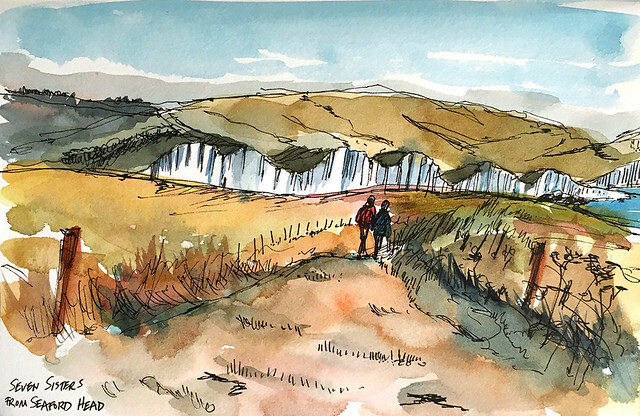 I sat on the trail and sketched, dodging an incessant hail of chalk particles kicked up by the sea breeze. While at the Seaford train station, we happened to catch the filming of the upcoming movie "Hope Gap," starring actor Bill Nighy. It was odd to see the guy from "Love Actually" standing not 10 feet away from me on the platform! Our coastal sojourn was very relaxing, and it was my first time walking along a seafront while in the UK. Recap: Stop, Drop & Sketch!